Marshawn Lynch and the Seahawks, 12-2 overall this year, have not lost at home since 2011. TEMPE, Ariz. — Cardinals coach Bruce Arians didn’t want to give this week’s opponent a psychological edge when he was asked if the Seahawks (12-2) are a dominant team. "I think they’re a very good team, but I think they’ve lost games this year — and to teams we beat,” Arians said, alluding to the Colts. “So I think they’re a very good football team. Dominating is a strong word. But they are solid and they’re physical." Maybe Arians is right about the Seahawks when it comes to road games, but at CenturyLink Field, the word "dominant" accurately describes the Seahawks. They have won 14 straight games at home with no losses the past two seasons, and they are outscoring opponents by an average of 32.7 to 14 this season. There’s been a lot of talk locally about the Cardinals’ upward trajectory since a 58-0 loss in Seattle last season and a 34-22 loss earlier this season at University of Phoenix Stadium. But the Seahawks have been on a similar, albeit more impressive, upward arc since those games. Which makes you wonder: Do the Cards’ playoff hopes rest on a road win against a team seemingly destined to win the Super Bowl? "We’re not done yet," Seahawks coach Pete Carroll said Wednesday during a conference call. "We look at it as every game that we play may be the one that decides a championship, so when we get in times like this, this isn’t different for us." If Seattle wins Sunday’s game it will clinch home-field advantage throughout the NFC playoffs, which is clearly a big deal when you haven’t lost at home since 2011. There are plenty of reasons for this rapid rise. The Seahawks defense is the NFL’s top-ranked unit, with a big, physical, ball-hawking secondary that leads the league in interceptions (22). Cornerback Brandon Browner was suspended indefinitely this week, but cornerback Richard Sherman (two picks last week) and safeties Earl Thomas and Kam Chancellor give Seattle loads of talent even without him. Arians also noted that the Seahawks have a host of players who can rush the passer, making it all the more difficult to game plan against them. Five Seahawks have at least four sacks. There is also physical running back Marshawn Lynch, who is sixth in the NFL in rushing yards (1,089) but tied for first in rushing TDs (11). But the biggest reason for Seattle’s sudden rise the past two seasons is second-year quarterback Russell Wilson, who dropped to the third round of the 2012 NFL Draft due to various concerns, including his size (5-foot-11). Clearly, he is aided by the Seahawks’ potent run game, but Wilson has the NFL’s sixth-best passer rating (105) and eighth-best completion percentage (64.7) and has thrown 24 TDs to just eight interceptions. The guys around him in all those rankings are veterans. Wilson is just playing like a veteran. "When Russell came in here to take over the quarterback spot, we took a jump, and by the halfway point of last year we finally kind of hit it, and we’ve been on a pretty good run since then," Carroll said. "I think to maintain the consistency is to get better. To do it last year and then to come back and do it again this year; just look at the young guys that have not been able to do that. That’s getting better. "Your numbers don’t necessarily have to improve, but consistency over these kinds of challenges, I think it shows you that the guy is on, he’s real and that you’ve got to deal with him, and that he’s a tremendous asset to our football team." Wilson’s 23 wins are the most by a starting quarterback in his first two seasons in the Super Bowl era, and he has 50 TD passes, making him one of just three QBs — Dan Marino (68) and Peyton Manning (52) are the others — ever to throw that many in their first two seasons. Carroll believes — and his age makes this seem logical — that Wilson won’t hit his peak for a couple more seasons. Like his team, Wilson is still on the rise with bigger goals ahead. 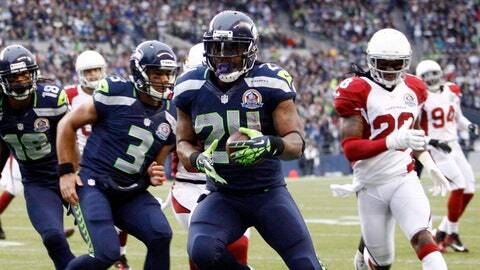 If Cardinals fans were hoping the Seahawks might let off the gas this week, they’d better think again. "We’re staying in our little cubicle, our little bubble and our little corner up there in the Northwest," Earl Thomas said. "It’s not so much the game, it’s just a moment. It’s a big moment. It’s a big opportunity. That’s how we take it every time out. It’s a championship opportunity. We win this game, we lock up a lot of stuff." Offensive rankings: The Seahawks are 12th overall at 354.5 yards per game (24th passing, 213.5 yards; 2nd rushing, 141 yards). The Cardinals are 19th overall at 339.5 yards per game (14th passing, 245.4 yards; 25th rushing, 94.1 yards). Defensive rankings: The Seahawks are 1st overall at 279.5 yards per game (1st passing, 174.2 yards; 10th rushing, 105.3 yards). The Cardinals are 7th overall at 322.3 yards per game (17th passing, 239.1 yards; 1st rushing, 83.2 yards). The Cardinals’ injured players: Larry Fitzgerald is likely to play one week after sustaining a concussion; Seattle has a big, physical secondary. QB Carson Palmer was walking with a limp during the open portion of practice this week; Seattle has a fierce pass rush. Those are risky combinations. The run game: If Seattle has a weakness, it may be its run defense, which still ranks 10th in the NFL at 105.3 yards per game but allows 4.1 yards per rush, which is just in the middle of the NFL pack. Given the prowess of the Seahawks secondary and their fierce pass rush, you’d have to think the Cardinals will try to force a steady diet of Rashard Mendenhall and Andre Ellington to set up their play-action game. It’s also reasonable to expect the Cards’ recent trend of shorter passes (at least early in the game) to continue. Offensive line penalties: Since 2005, opponents have committed 121 false start penalties at CenturyLink Field. That leads the NFL. Coach Bruce Arians said this week that the line will use silent snap counts to combat the noise in Seattle, but that doesn’t always do the trick. Against a defense that will keep yards and points at a premium, penalties can be drive killers. — Seahawks CB Brandon Browner, who has started 36 regular-season games in the last three seasons for Seattle, was suspended indefinitely on Wednesday for violating the NFL’s substance-abuse policy. Byron Maxwell likely will fill his spot. — QB Carson Palmer has 13 TDs, four interceptions, a 68.9 completion percentage and a 106 passer rating in his last seven games. — LB Karlos Dansby leads the NFL in solo tackles (105) and passes defended (20). — Seahawks LB O’Brien Schofield played for the Cardinals from 2010-12. — Seahawks TE Zach Miller played high school ball at Phoenix Desert Vista and college ball at Arizona State. Miller was a teammate of Cardinals G Paul Fanaika. — The Seahawks (33) and Cardinals (28) defenses rank second and fourth in the NFL in takeaways. For the Cards, S Rashad Johnson (ankle) is doubtful. WR Larry Fitzgerald (concussion), TE Rob Housler (groin), QB Carson Palmer (right elbow), and LB Matt Shaughnessy (groin) are questionable. RB Andre Ellington (knee), WR Michael Floyd (ankle), LB Karlos Dansby (foot), RB Rashard Mendenhall (finger), LB Matt Shaughnessy (groin), CB Justin Bethel (wrist) and LB Dontay Moch (hamstring) are probable. For the Seahawks, LB K.J. Wright (foot), WR Percy Harvin (hip) and G J.R. Sweezy are out. CB Jeremey Lane (ankle), G JR Sweezy (concussion). TE Zach Miller (ribs), RB Robert Turbin (groin), S Kam Chancellor (quad), DE Chris Clemons (non-injury) and RB Marshawn Lynch (non-injury) are probable. Perhaps the playoffs. If the Cardinals lose while Panthers beat the Saints in Charlotte, Arizona would be eliminated from postseason contention. If the Cards wins, they can’t be officially eliminated regardless of what happens elsewhere. Even if San Francisco and Carolina (10-4) both win, Arizona could potentially catch New Orleans (10-4) for a wild-card spot in that scenario. However, the Cardinals can’t win a three-way tie with the 49ers and Panthers, so if they lose, they have to hope that the Panthers lose and the 49ers win, which would allow for the possibility of a tie at 10-6 with Carolina, which Arizona would win by virtue of this season’s head-to-head victory. The Seahawks haven’t lost at deafening CenturyLink Field the past two seasons (14 straight wins) and are playing for home-field advantage throughout the NFC playoffs (a win in this game clinches it). This is as tough an assignment as the Cardinals could possibly face — maybe just a little too tough.